Nuxeo Drive for Mac uses 100% CPU all the time, consuming rapidly my battery, what can be done to minimize the CPU activity? I imagine that you have a lot of files in your Nuxeo Drive folder. This is a known issue tracked by https://jira.nuxeo.com/browse/NXP-10951 on which we have planned to work at the beginning of next year: for now the client spends a lot of time scanning the file system to detect changes, whereas it should use a notification mechanism to get informed of the actual changes, which would obviously eat less CPU and battery. Try to minimize the volume of synchronized folders / files (maybe by making a more granular choice of the synchronized folders at a lower level in the document hierarchy). A big (let's say infinite) max-sync-step: this is the number of documents to synchronize before refereshing the local DB, remotely and locally, so if you set this parameter as large enough to cover the total number of local files / folders, Drive will synchronize all of them before doing a local scan. The default value is 10. A bigger delay: this is the delay in seconds between consecutive sync operations, to lower the frequency of local scans. Default value is 5 seconds. ataillefer Even though the Jira ticket is marked as closed 2 years ago, I still face the same problem. The last changes done to my Nuxeo instance were 20 hours ago (last sync action), and I have the same amount of files as in my Dropbox folder (actually I am syncing Nuxeo files with Dropbox). 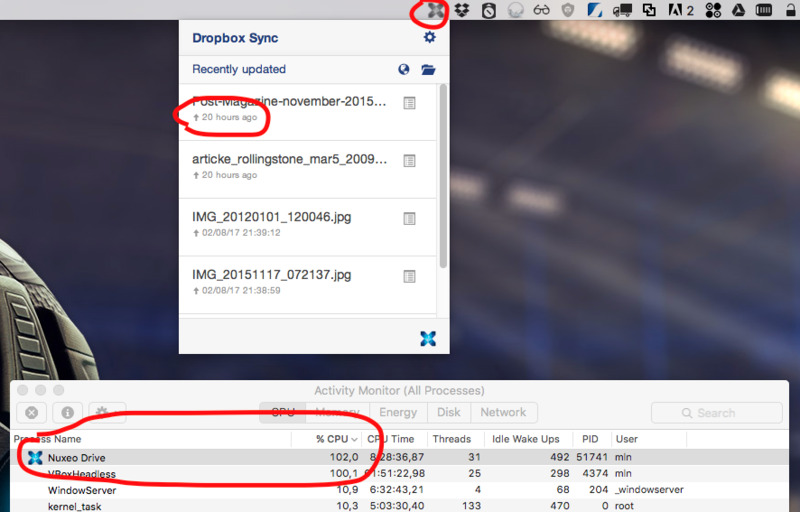 While the Dropbox client has 0,3% CPU usage, the Nuxeo drive is at over 100% CPU even though nothing happens. The Nuxeo Drive contains about 10 workspaces with a total of 1.2 GB of files. Since the Dropbox client does not use any (or just 0,3%) CPU at all, I assume they're using a different algorithm to determine whether files have changed or not? Rémi Cattiau I will try to reproduce it again and then send it again next time. Right now it's at a normal CPU usage since yesterday, even after restarting the app (via Finder > Open). Not sure if it has still saved the params that I passed with the previous start on command line. Hi. I have the same problem, and the settings provided do really bring the CPU usage down. However, the way it is being instructed to launch the application locks a Terminal window while the application is running. It only returns to the prompt when you quit the nuxeo-drive App... and if you close the Terminal window, the application dies. An alternative way to launch the application with arguments, and not holding a Terminal window, is: open -a /Applications/Nuxeo\ Drive.app --args --max-sync-step=1000000 --delay=60 Nevertheless, I would prefer that the application would not refresh/reset the file `~/LIbrary/LaunchAgents/org.nuxeo.drive.plist` every time it is (re)started and could enable the setting of these startup parameters (and others) in it, like: Label org.nuxeo.drive.agentlauncher RunAtLoad Program /Applications/Nuxeo Drive.app/Contents/MacOS/Nuxeo Drive ProgramArguments --max-sync-step=1000000 --delay=60 Thanks for the info. I have the same problem, and the settings provided do really bring the CPU usage down. However, the way it is being instructed to launch the application locks a Terminal window while the application is running. It only returns to the prompt when you quit the nuxeo-drive App… and if you close the Terminal window, the application dies. Indeed the right way to launch Nuxeo Drive without locking a Terminal window is to use the open command. 1/ The application should not systematically reset the launch agent at startup. This has just been fixed in https://jira.nuxeo.com/browse/NXP-13677 and is available in the last successful build, downloadable from Jenkins. 2/ The commandline options such as –max-sync-step and –delay should be propagated to the launch agent. Created https://jira.nuxeo.com/browse/NXP-13678 to track this improvement.